While some people enjoy creating dinners full of variety and color, carefully selecting ingredients and crafting different tastes for their family each night of the week, I am not one of those people. Don’t get me wrong; I like making colorful cookies at the holidays, or baking brownies with the kids (yes, I have a major sweet tooth), but lately I just don’t have the time to plan and shop for ingredients to make meals. That lack of time and desire to plan meals has led to us eating a lot of processed, unhealthy fast food. We are consciously taking steps to reverse the nasty effects that has on our bodies, but it’s not always easy. Seriously you guys, meal kits save SO. MUCH. TIME. 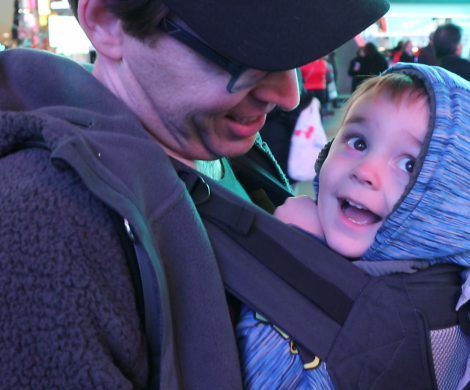 I love the fact that I no longer have to plot way ahead of time what I need to shop for, then load the kids into the car, try to corral them in the store, battle the always-at-kid-eye-level candy displays in the checkout line, buckle them back into their car seats, lug the groceries into the house, and put them all away. 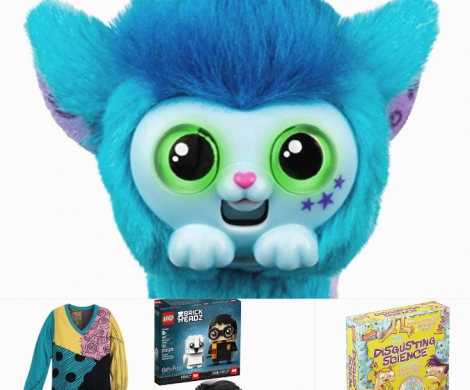 I just go online, pick what looks yummy, order it, and wait for it to arrive at my door! I really like that the ingredients come mostly chopped up already. Big time saver! But where do you start? 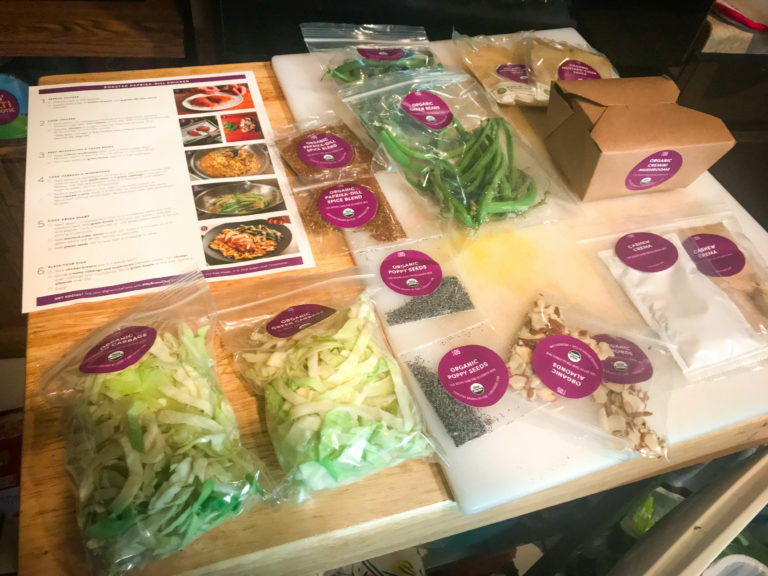 There are TONS of different meal kit options out there…you may have heard of ones like Plated, Blue Apron, Hello Fresh, etc, but there are also plenty of niche-y ones for very specific diets. Since we can’t have dairy or gluten, this eliminated a few of the more mainstream and budget options. Wanting to eat healthier also narrowed it down further. Since they were pretty comparable in price, I decided to test out a few different options and see which we preferred. 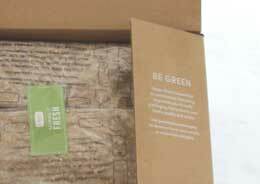 One week, I ordered meals from Green Chef, and another I tried meals from Sun Basket. 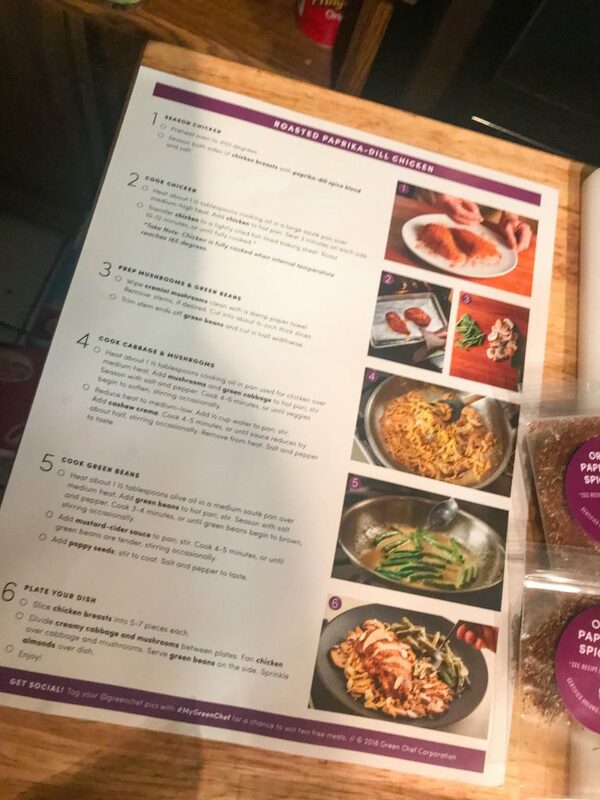 On the week that my husband traveled out of town and I didn’t want to cook much, I tried meals from the pre-prepared kits at Freshly. 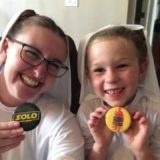 and see which one might be the best fit for your family! First up is Green Chef. 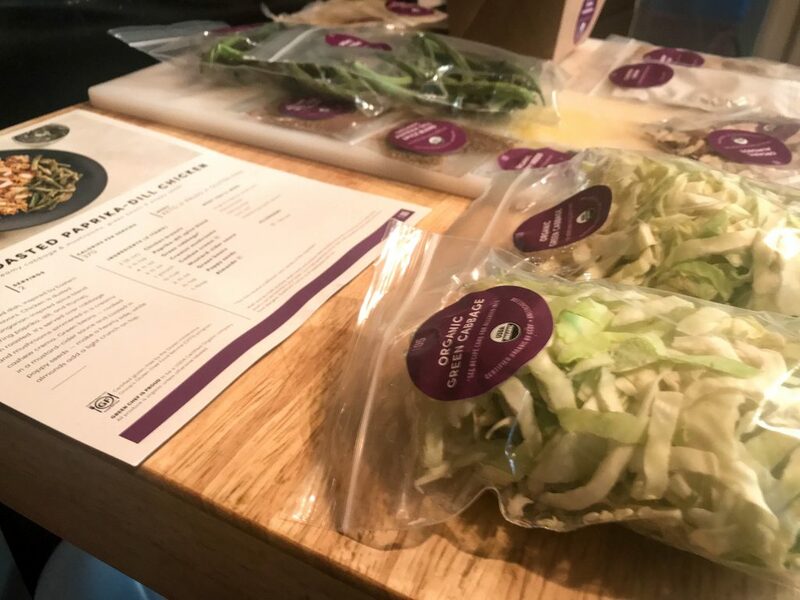 Green Chef promises that you can “Cook clean, affordable dinners week after week with step-by-step recipes, select pre-measured, premium ingredients, and meal plans for all diets.” It is also a USDA Certified Organic Company, which is good to know. 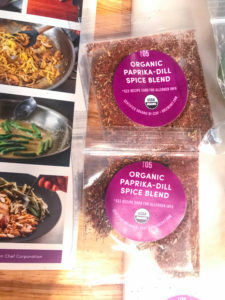 I also like that they strive to be environmentally friendly, too, stating “Green Chef is all about eating and living green…We work with farmers to source sustainable, delicious ingredients.” Awesome! The boxes come delivered to your door, packaged with frozen ice packs and insulation that keeps your meat and vegetables nice and cold. (This is great for when you bring it into the house, then get distracted and forget to actually OPEN the box for hours. Not that I’ve done that or anything…heh heh) Mine came in two big boxes, because I ordered two servings in order to fit my family of four. The kids are still small enough that they generally can split “one serving,” which leaves another serving for lunchtime leftovers another day. 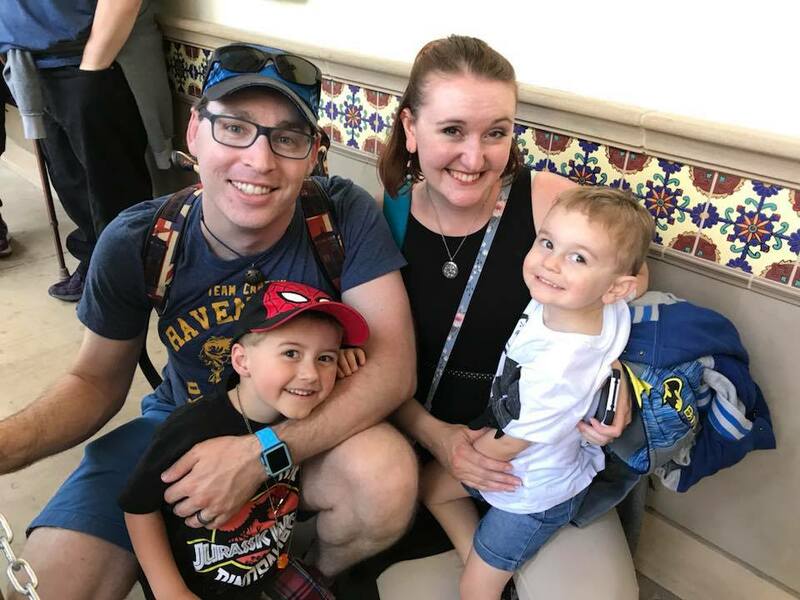 (*Note: There is also a “Family Plan” which gives you larger servings at a discounted rate, but since we have to avoid dairy and gluten, this wasn’t an option for us because it’s less customizable than the other plans.) Once you unpack everything, the box and the insulation can easily be recycled. Even the ice packs can either be reused if you have room in your freezer, or you can let them melt, cut them open, and discard the biodegradable contents for the packaging to be recycled. Knowing that we had to avoid certain ingredients, I knew that I could pretty safely pick from the Paleo menu, and possibly the Gluten-Free or Vegan menus. If there was a recipe that looked like it had cheese as a big part of the meal, I’d simply choose another menu. 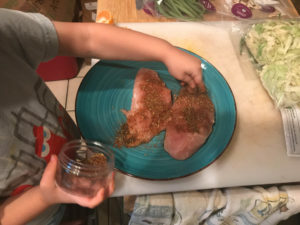 I feel like the inability to switch out individual meals is the one downside of Green Chef for food allergy families. Sometimes I wanted something off the Carnivore menu, but one of the meals had pasta and cheese that we couldn’t eat, so now I couldn’t choose that menu. 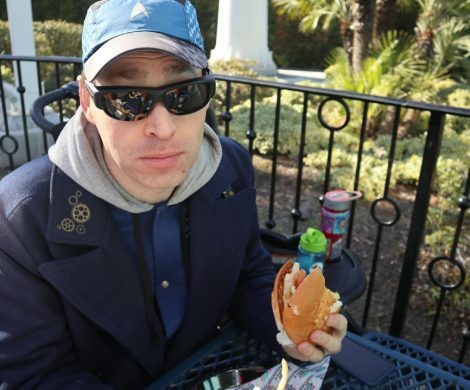 If there was the option to substitute another meal into a menu, it would be wonderful! If you have food allergies, please be careful to check the ingredient list of each recipe on your chosen menu before you order. Recipes are clearly laid out, with pictures of each step. This week, I believe I went with the Paleo menu. It had a good balance of filling proteins and colorful vegetables, and everything sounded yummy. Tonight’s meal: Roasted Paprika Dill Chicken. I like that each meal comes color-coded, in case you unpack the materials from their individual bags and they get mixed up. This meal was purple, which you can easily see when you lay out the ingredients. 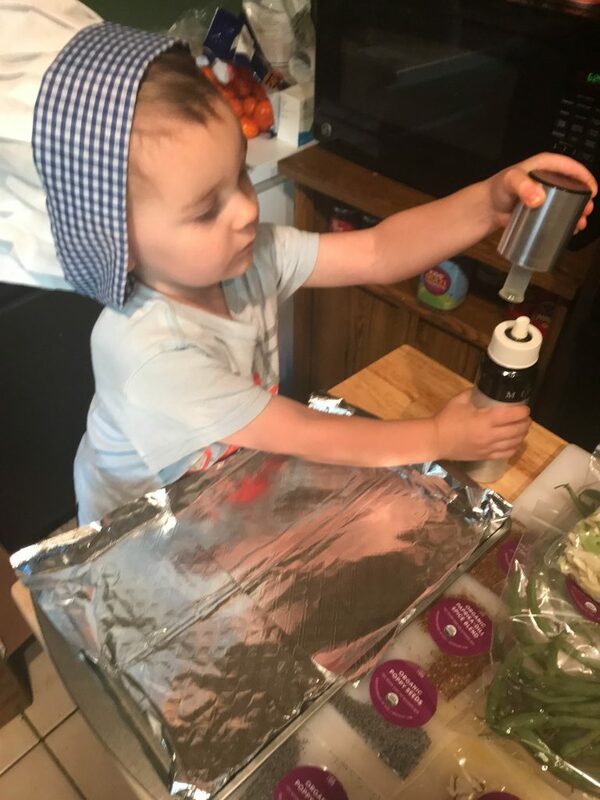 With my 2-year-old helper ready to assist while his big brother was at dance class, (kids can learn so much from cooking! Check out my post here about how we do that) I set out to attempt to match the picture on the recipe. One of the things I appreciate about Green Chef is that many of the ingredients come pre-chopped. 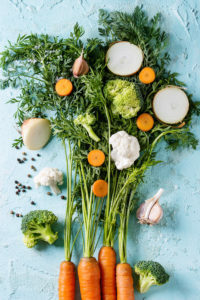 It’s always wise to wash any produce, and there may be some simple prep like slicing the mushrooms or cutting the ends off green beans, but things like pre-chopped cabbage and onions really saves time. (Not to mention, Josh and I always argued about who got stuck with the task of chopping the onions while tears streamed down our face). These kits assume that you have basic cooking supplies and staples ready at home, so make sure you’re stocked up on things like salt and olive oil. The Misto olive oil spray can. Love this! (I also had to prepare a cookie sheet with cooking spray, which was pretty simple.) 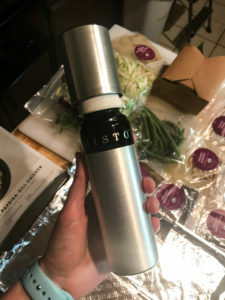 Speaking of which, one of my favorite gadgets in the kitchen, is this handy little thing called the Misto. It’s a refillable spray bottle that you can fill with your favorite healthy oil (we use extra-virgin olive oil), then pump to build up air pressure just like using cooking spray. It saves money and is healthier than using an aerosol version! You can find it on Amazon here. (It makes a great present for the foodie in your life!) My kids love when I let them use it. It’s an easy way to let them help out! There were also plenty of other little tasks I let him do, like washing the mushrooms and seasoning the chicken. With the chicken seasoned and seared, it was time to put it in the oven. Now while it cooked, I could focus on assembling the vegetables in the frying pan. 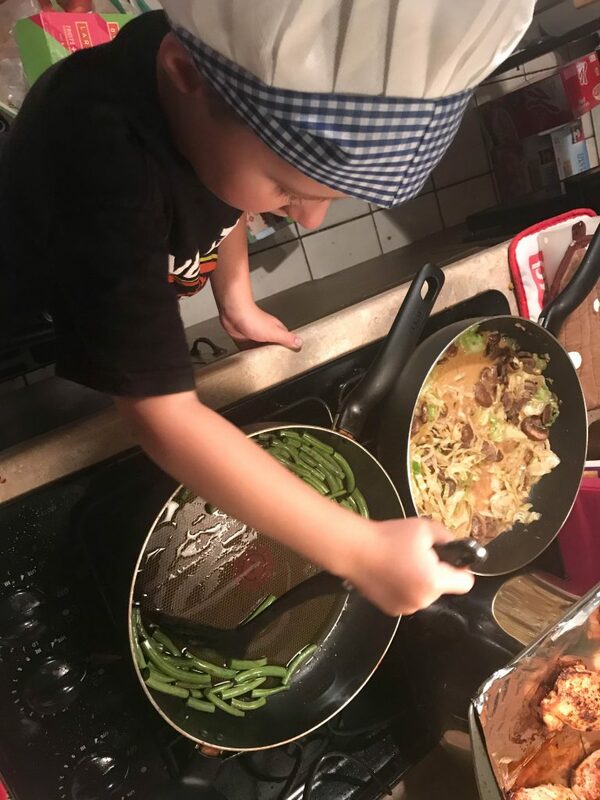 Of course this was the exact moment that big brother got home, insisting that he wanted to help out too because “Toby already got to do things!” So being extra careful of the hot pan edge, I let him stir the cabbage and mushrooms, and put sauce on the green beans. Ooo, things were starting to smell good! The veggies seemed to finish right around the time that the chicken was ready to pull out of the oven, so we were almost done! Now it was time to plate everything. 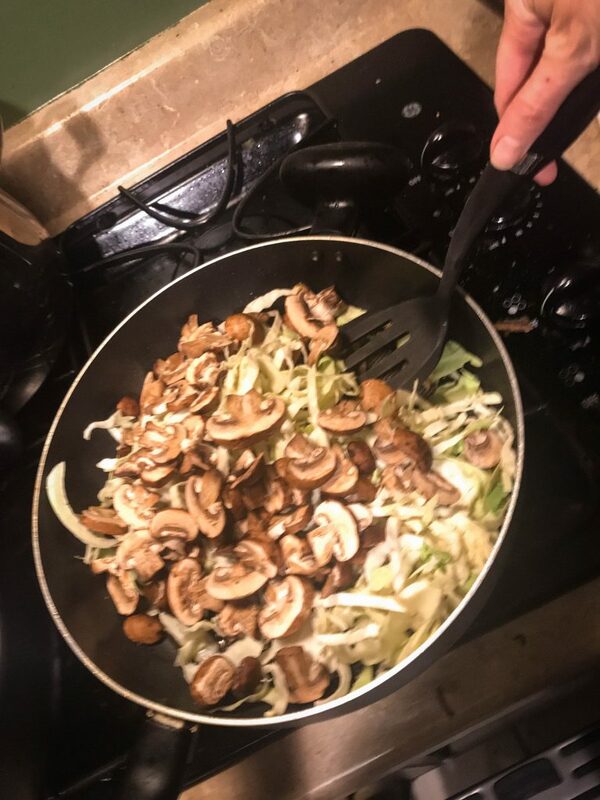 The directions said to spread the veggies on the plate, then lay the sliced chicken on top and drizzle it with sauce before adding sliced almonds. The green beans seemed like there weren’t quite enough for the whole family, so we ate those all in one sitting. But except for the mess I made with the sauce, I think it looks pretty darn close to the picture on the recipe card! Overall, we were pretty happy with Green Chef’s selections this week. The meals were all tasty and filling, and probably a lot more unique and varied than we could have come up with on our own. I’ll definitely use this service again in the future! 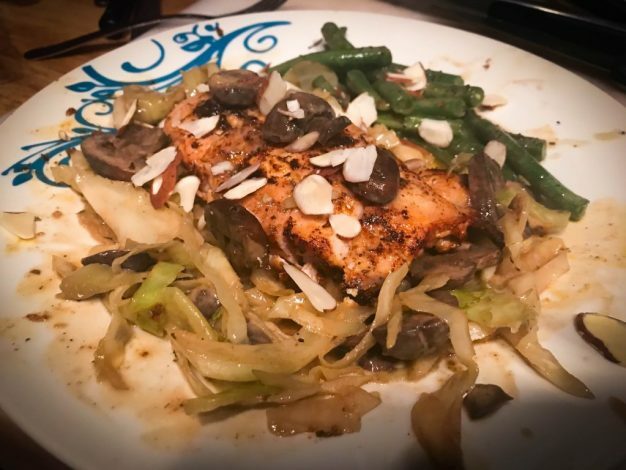 http://greenchef.com/invite/edx9rq to get 4 free meals. Want to see how Green Chef stacks up against similar meal planning company Sun Basket? Tune in to Part 2 of my Meal Kit Review series next week! 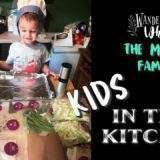 What do you look for in a family meal kit? Tell us in the comments below!